- What is a Derivative? Textbook: Calculus (Early Transcendentals version), 8th edition, by Anton, Bivens, and Davis (2005), Wiley. 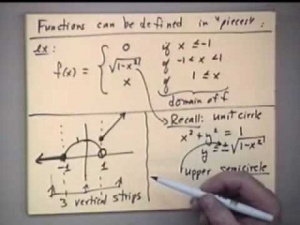 - In 2005, Richard Delaware spent 8 months recording a Calculus I course on video for the VSI (Video-based Supplemental Instruction) program at UMKC. "Supplemental Instruction" in this sense does not indicate a remedial course, and no content or conceptual richness has been sacrificed. College Algebra was the first mathematics VSI course to be recorded, but the VSI concept which has been in place at UMKC since 1992 has attracted national attention because of its success in 3 other video courses taken by students at UMKC and at 30 other institutions in Missouri. - Although video technology is commonplace, the pedagogy is fresh. Students view the tapes in the presence of a trained facilitator, and have control over the flow of information; lectures are stopped, started, and replayed as needed. When the facilitator pushes the stop button, as cued on the video, students have time to work problems, ask questions, make observations, resolve confusions, collect their thoughts, and more. - This VSI course has been offered since Fall 2005 off the UMKC campus to advanced students at rural high schools, and on the UMKC campus to students requiring more time and assistance to succeed in Calculus I. - The course was recorded in a UMKC video studio by the Multimedia Technology Services division of Instructional Technologies. UMKC's Professor Richard Delaware in Lecture 1: A Review of Precalculus. Matt Smith wrote 6 years ago. richy wrote 7 years ago. Syd Dogonniuck wrote 8 years ago. pratik wrote 8 years ago. idiado esosa wrote 8 years ago. ZRROBHERTTS L-OWWUSU-GYAW wrote 8 years ago. lectures - if there is? Wonder wrote 8 years ago. chandan kumar wrote 8 years ago. menna wrote 8 years ago. blank frank wrote 8 years ago. wastes A LOT of paper! Get this guy a smart board, please. CosmoLearning is promoting these materials solely for nonprofit educational purposes, and to recognize contributions made by University of Missouri-Kansas City (UMKC) to online education. We do not host or upload any copyrighted materials, including videos hosted on video websites like YouTube*, unless with explicit permission from the author(s). All intellectual property rights are reserved to UMKC and involved parties. CosmoLearning is not endorsed by UMKC, and we are not affiliated with them, unless otherwise specified. Any questions, claims or concerns regarding this content should be directed to their creator(s).